Number 5 Type Collection: Type Site: Section 36, "5 is for..."
Type Site: Section 36, "5 is for..."
During the off-season, Red Sox fan site Section 36 covers a wide range of baseball topics, numbered 1 to 36. It fills the chilly winter months for locals like me, who spend most of February creating spreadsheets that analyze snow accumulation. 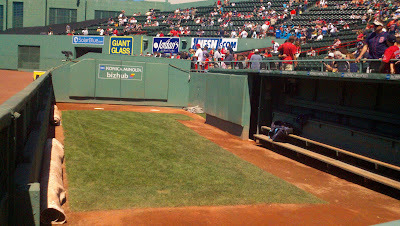 Today's fifth post for 2011-12 talks about Fenway's short (5') wall in front of its side-by-side outfield bullpens. "To me it looks like a fairly careful calculation. Obviously they took an average player and stood him up against a wall. They had him take a little hop, as if he were reaching for a ball. They then marked the spot where his ribs were. 5 feet. That way, anyone crashing into the wall would be sure to at least bruise a rib, if not break it completely and puncture their lung." Jay Buhner made one of Seattle's pinnacle defensive plays by leaping this wall to bring back a bomb hit by Moneyball binky (and former Sox slugger) Scott Hatteberg on June 29, 1997. Another Mariner high point: "Buhner Buzz Cut Night"
Thanks for the highlight reminder and find more Sox stuff at Section 36.